Most mind maps are shown as 2D views of a graph with central nodes. 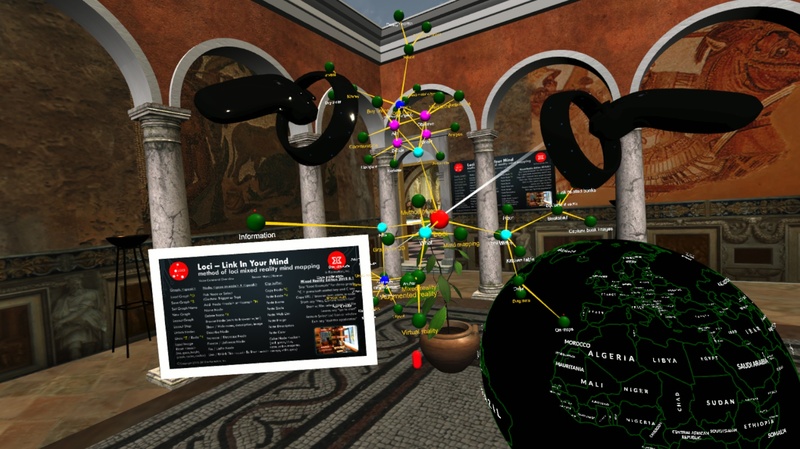 It is generally better for comprehension to see and interact with a 3D version of the same graph to understand the relations between its nodes. In the paper Using augmented reality for visualizing complex graphs in three dimensions by D. Belcher, M. Billinghurst, S Hayes, and R. Stiles, published in the International Society for Mixed and Augmented Reality (ISMAR) 2003, the study results (link) showed that there is a significant advantage with reduced error for 3D views over 2D views of the same graph when trying to determine if nodes are connected (linked) to each other, which is a key capability when trying to comprehend a graph (or mind map). The study shows that this improvement of 3D views and interaction with complex graphs also transfers to augmented reality, and not just desktop 3D. In the graph from the paper, you can see significantly reduced node link comprehension error for 3D desktop and AR over the conventional 2D case, and this relationship holds as the number of nodes in the scene scales up.